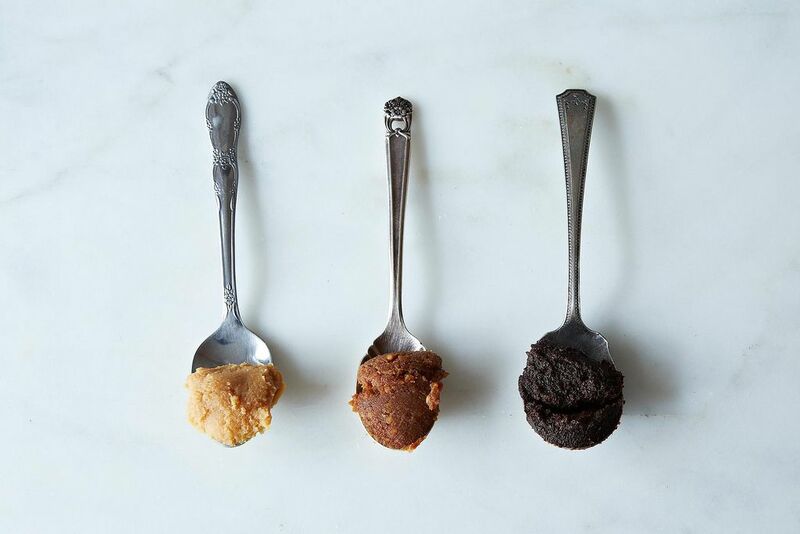 Nancy Singleton Hachisu, author of Preserving the Japanese Way, teaches us that making your own miso is totally doable—and worth the few months. The idea of making miso from scratch always gave me pause. Even after spending 20 years living on a Japanese farm, I never worked up the courage to attempt it. 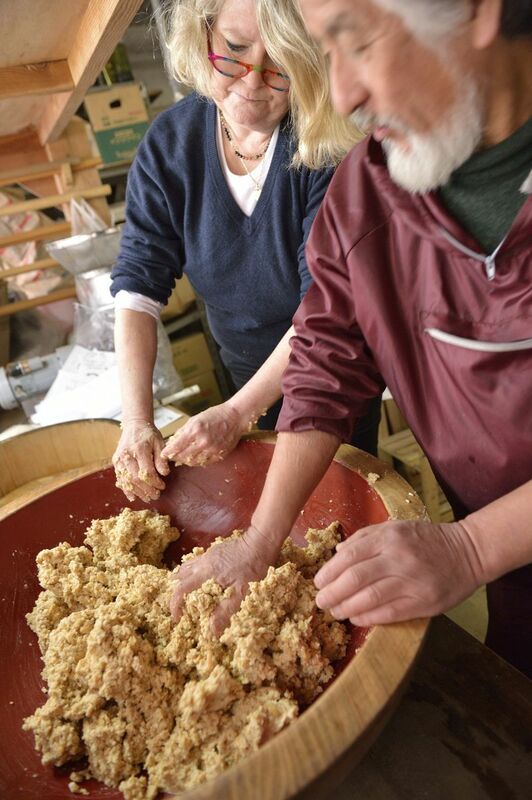 But finally, in the winter of 2012, I joined a miso-making group. (Safety in numbers!) And to my surprise, one thing became quite clear: It is very difficult to mess up miso. Truly. 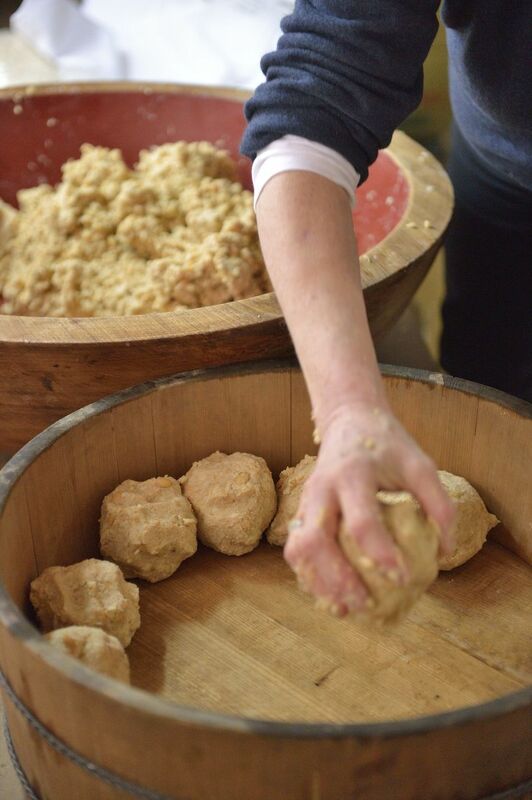 There are typically two factors involved in making miso: weighting it down to keep mold from creeping in and placing it in a warm place to allow it to ferment, usually outside during the summer. 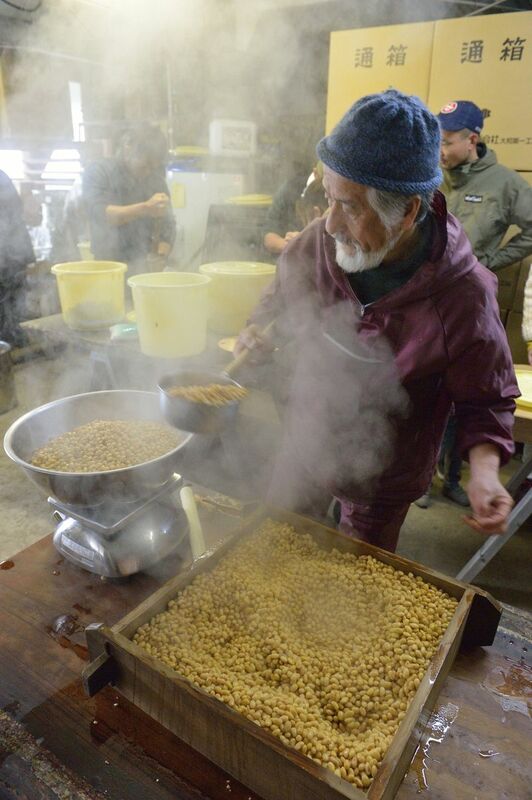 But at my local organic miso company, Yamaki Jozo in Saitama, Japan, the staff leaves a small pot of miso out at room temperature year-round, with only minimal weight. A regular stir up is all the care it requires—and the result is absolutely stunning. The beauty of miso is in its forgiveness. You can almost do anything to it and it will still ferment. Another friend leaves his miso in a thick-walled storage building where the temperature is fairly constant. 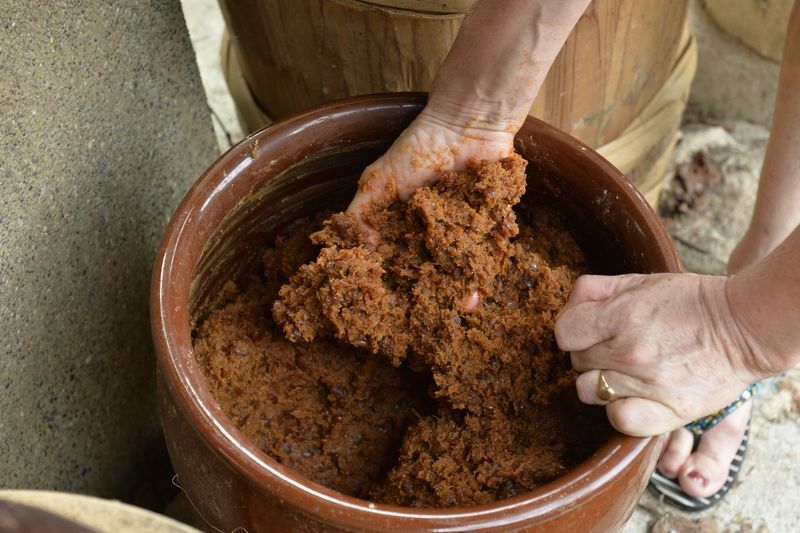 He also does not weight the mash traditionally but rather lays a thick paper feed bag across the surface, fills that about 2 inches (5 centimeters) deep with rice bran, then covers the pot with another feed bag, which he ties down with twine around the circumference of the pot. I like hearing these stories because my miso-making endeavors are always a bit slapdash: Did I stir it recently? Did I weight it this year? Sometimes it is hard to keep track. Other pickling or fermenting projects may go bad, but the comforting thing about miso is that it normally won’t. The worst thing that can happen is a bit of mold. When that happens, scrape the mold off carefully, stir the mash well, pat it down, weight it, and leave it be for a while until the next stirring. More: How to make miso soup without a recipe. Nonetheless, be mindful of the timing. Give the miso mixture time to ramp up to fermentation mode. That means you must start the miso at least two months before the weather turns warm. And if possible, make sure your miso mash is sitting in a warm environment (at least 80°F /27° C) for a few months. It's possible to keep the miso indoors as long as it's relatively warm and you stir it often. You may also choose to make your miso mash, then keep it in the refrigerator until the weather cools to at least 50° F. The miso needs to go through a cold winter, a cool spring, and a hot summer to properly ferment, so regardless of the process you choose, it will be ready in September of the following year. And most importantly, do not be intimidated by the length of this method. The explanation is longer than the process! Once you have made miso, you will know how truly simple it is and that the result is exponentially more tasty than what you can find on the shelf. And it will be yours. Start the process about two to three months before the weather starts to warm, when it's about 50° F out (the miso will need to ferment outside over the warmer months.) In a large pot of cold filtered water, soak the soybeans for 18 hours. Drain the beans, return them to the pot, then refill the pot with water to about 5 inches (10 centimeters) above the beans. Bring to a boil over high heat, lower to a simmer, and cook for about 1 1/2 to 2 hours, uncovered, until the beans are soft. The idea here is to simmer the beans in just enough liquid so that they cook through, but that most of the liquid will be boiled off eventually. 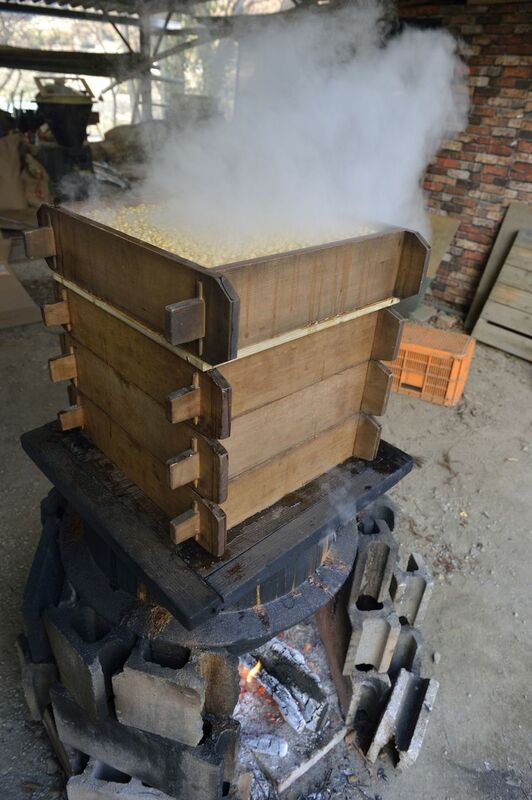 A note on the cooking: Traditionally, the beans are steamed for 1 1/2 hours in wooden steaming boxes stacked over a large cauldron set over a very hot wood fire. If you steam the beans you will need to double the amount of seed miso and water that you add to the mash with the koji and salt. The beans can also be cooked in batches in a pressure cooker for about 20 minutes over high heat. While the beans are cooking, slowly whisk 1/2 cup of hot water into the seed miso, then allow to cool to room temperature (the solution should be like a very thin miso soup in consistency). 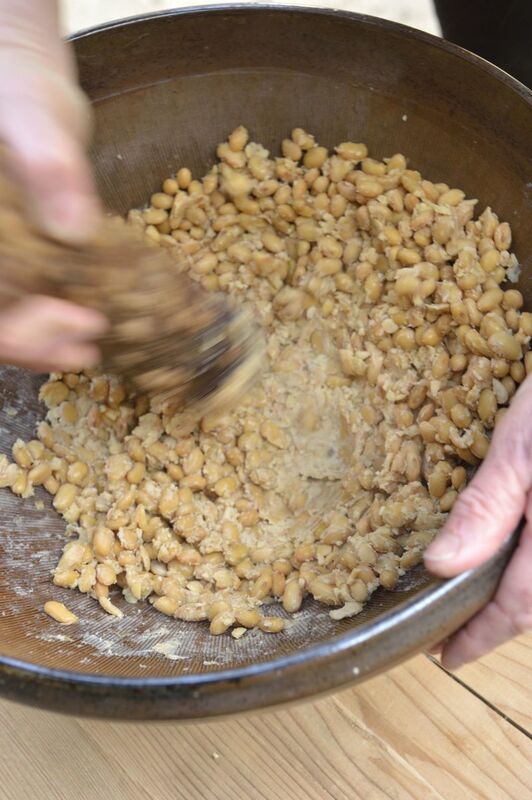 Drain the cooked beans and start mashing them into a coarse consistency. I like to grind them roughly in batches in the Japanese grinding bowl (a suribachi). Alternatively, you can run the cooked soybeans through a sterilized meat grinder. Or, you can opt for the low-tech squeeze between your thumb and index finger method. When the beans are smashed to your satisfaction (chunky or smooth), allow them to cool to room temperature (too hot and it will kill the spores). 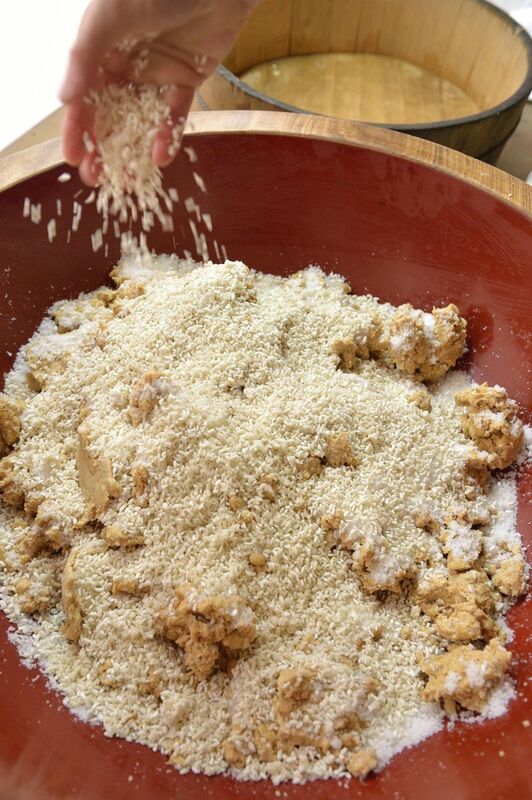 Pour in the rice koji, then sprinkle in about 80% of the salt, and add in the miso thinned with water. Knead well to distribute the rice koji and salt with the mashed beans. Place a large crockery pot, small wooden barrel, or food-grade plastic vat on the floor, with a piece of plastic sheeting underneath. Then, using your hands, form tennis ball–sized spheres of bean mash and throw them into the container with all of your might. Whack! Splot! You are looking for a satisfying splat that sounds like thunk rather than a weak glurp. Or (if you are lazy like me, with stunningly bad aim), you might mash the balls in with your fist and the heel of your hand to ensure that all air pockets have been filled. The bean mash should only fill the container about halfway full. 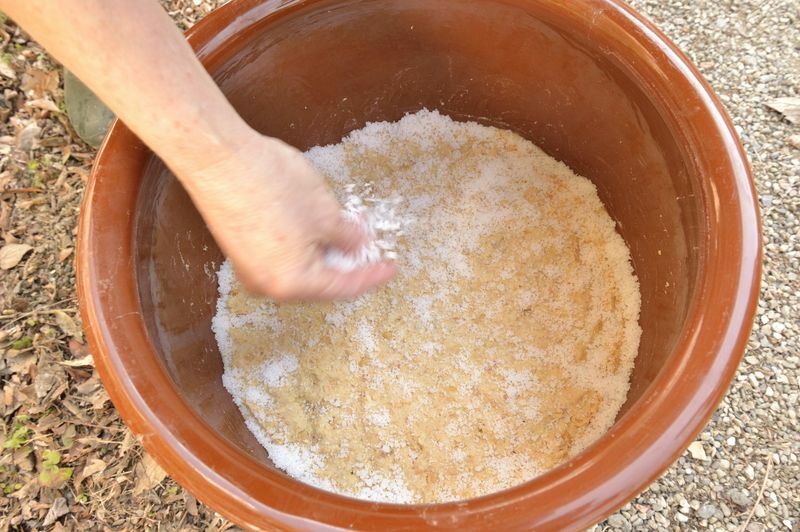 Pat down the surface of the mash with the flat of your palm and sprinkle with the remaining 20% of salt. Smooth a clean muslin cloth across the surface of the mash and let it drape down over the sides of the container to keep out flying leaves or other debris. Place a wooden or plastic drop lid on top of the cloth-covered mash surface and weight it evenly with 4 1/2 pounds (2 kilograms) of rocks or heavy objects that equal at least the weight of the mash. Cover with one more large muslin cloth and wind some twine a couple of times around the circumference of the barrel to tie the cloth in place. The cloth will act as a mold barrier and will become scarily dusted with green mold spores, so don’t skip or replace with plastic. Carefully remove to wash when you stir the miso. Let the young miso sit undisturbed in a shaded area outside until the weather warms. 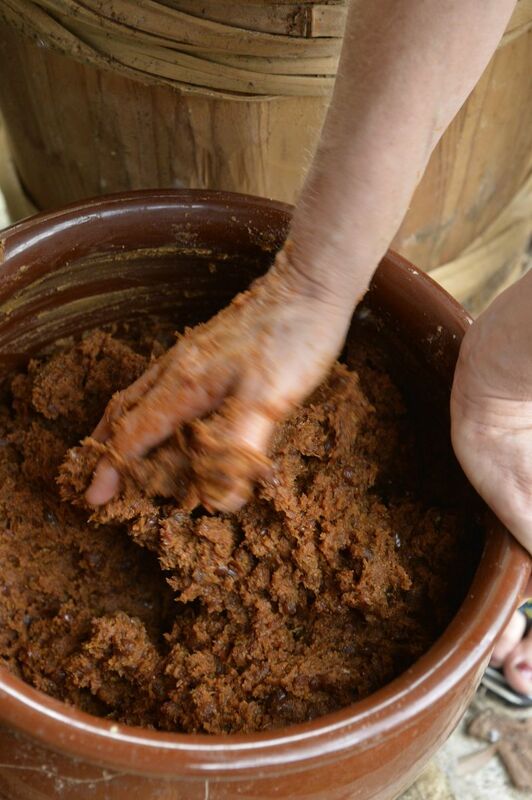 From May, start stirring the miso about once a month to avoid mold as the fermentation arc starts to ramp up. During the hottest period, you should probably stir the miso (from the bottom up) every 2 weeks to avoid mold forming. Ideally the weather should become muggy, and the temperatures should rise to about 100° F (38° C) at the height of the summer, but avoid direct sunlight. If you see any mold on the surface, carefully scrape it off. Clean the inside surface walls of the container with a vodka- or shochu-soaked cloth to deter mold. If you are feeling particularly adventurous, you could smooth a 1-inch (2.5-centimeter) layer of sake lees across the surface of the miso in June or July to seal and inhibit mold produced by oxidization. In this case, you really want to completely cover the surface to make a homogeneous layer (you still need to use the cloth, drop lid, weights, and outside cloth cover). 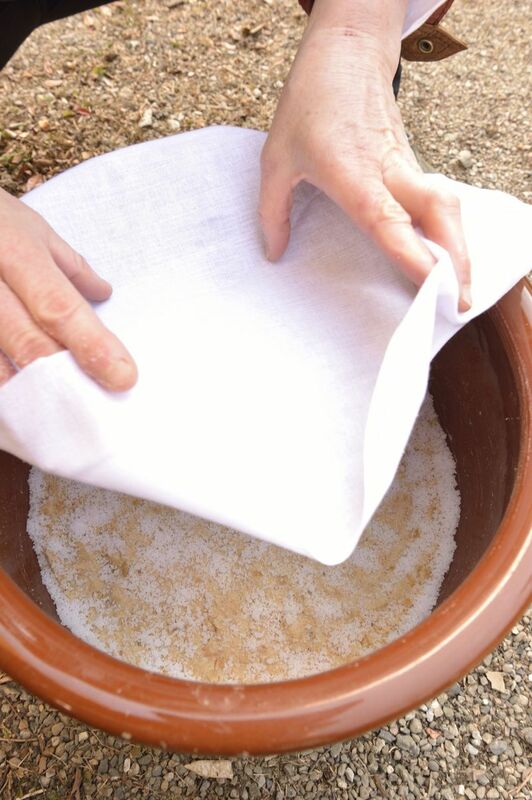 Peel off the sake lees when the weather turns cool in the late fall, and recycle the lees as an instant pickling bed. If you have not sealed the miso with sake lees, check the miso after the summer to see if it has mellowed to your liking. At this point, you can refrigerate it or just leave the miso in its fermenting container until you start your next batch in the coming winter. No need for weights once the miso is done—you can leave it outside if the weather is cool; otherwise store it in the fridge. First photo by James Ransom; all others by Kenji Miura. 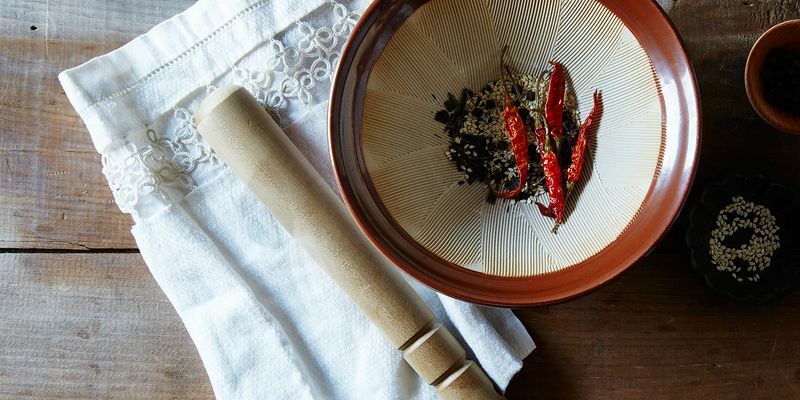 Nancy is the author of Preserving the Japanese Way and Japanese Farm Food. Any tips if I want to start this now in early spring? It is around 70F in my kitchen which I know isn’t ideal... but I want to get this started. Should I keep it in the fridge until it gets colder? Then is there a point to starting it now and not when it gets colder? Extra flavor maybe?? Hello. I'm getting ready to give this a go, but I was wondering if there is a minimum temperature I shouldn't go below in the initial stages of fermentation. I soaked my beans, tossed them with salt to start a ferment. Put them in the blender for faster cooking but reserved the liquid. Beans cooked up in no time and already "mashed." Just have to make the koji (in progress) and add. Reserved liquid will go into koji mix. I agree with Matilda, I think this is such a beautiful thing--how making miso must be in tune with the changing of the seasons. I'm disappointed that I'm reading this recipe in the beginning of spring as I would have loved to used this article to guide me in making chickpea miso. Oh well, hopefully this coming winter I will remember. I have heard of chickpea miso! Which I'm going to actually attempt with this recipe. I'm a bit late here, obviously, but I've seen both chickpea and black beans be made. Apparently there's even some versions that use lentils. Any legume would work. Potentially even peanuts may be able to be used, although the high oil content may complicate matters. I always wondered about this. Thanks for sharing! I love learning new things. 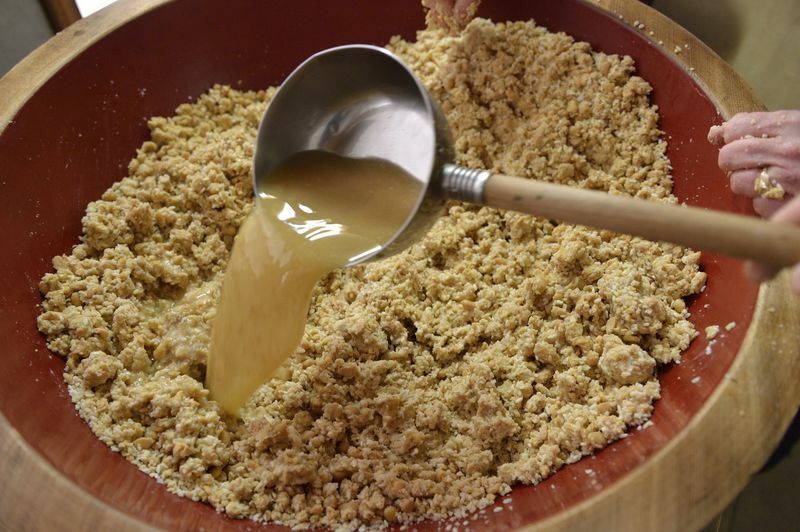 I'm so intrigued by the process of making miso! I'm not sure whether I'll undertake the process myself but I love how the method is so in tune with the seasons. idiots put their recipes online? The SALT is rediculious. Might as well just throw out 100 USD$$ and 4 hours of your time and eat some poison, This recipe makes completely unedible miso!! Koji can you explain what exactly happened with this recipe in your experience so we can judge for ourselves if we want to risk miso-making? Firstly, miso should not cost $100. Not sure where you got that idea. Additionally, this recipe calls for 400 grams of salt, of which only about 320 g are actually used in the recipe (the remainder is put on top to prevent airborne pathogens from infecting it). Given that the soybeans will likely double in weight after being cooked, 320 g of salt is right around 10% for miso weighing around 3 kg.